Art can take many forms from sculptures and art installations to graffiti and 3D chalk drawings. There are many techniques and what an artist uses depends upon his skills and preferences. Historically, this art form was used to decorate and brand various tools and musical instruments. Pyrography is also applied to leather items, using the same hot-iron technique. 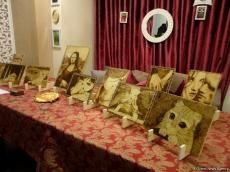 An exhibition of the wood burning artists has opened in Nizami Cinema Center in Baku. More than 40 works by four artists including Vusal AkhmAdov, Akshin Garayev, Alaghez Alikhanov and Lala Babayeva were put on display. The artists have been working in the team since April 2016. Their art works included portraits, architectural monuments, animals, landscapes, etc. The exposition was highly appreciated not only for its unique paintings but also another exhibits, including caskets, key chains, cutlery and other items. Moreover, a video about pyrography art was also shown to the viewers.